The property’s first reference dates back to 979, when Otto I gave the land to the bishop Wolfgang of Regensburg, who built a fortress called Ehrnegg in defense against the Turks. Most of the castle we see today dates from 1524, when Wolfgang von Oedt, cupbearer to Emperor Ferdinand I, bought and restored it. You can see his family crest over the entrance to the courtyard tower. Golfers rejoice! Right out the door of this charming castle lies a 9-hole and an 18-hole golf course. Discounts are available for castle guests. Breakfast is included at the castle but for the rest of your meals you may either eat at the golf club, 400 meters below the castle, or at any number of neighboring restaurants. The castle will put on dinners for groups of 20 or more. Steinakirchen is 126 km west of Vienna. The closest train station is at Amstetten. A delightful place; the entire castle may be hired; the restored private chapel was newly consecrated in 2002. 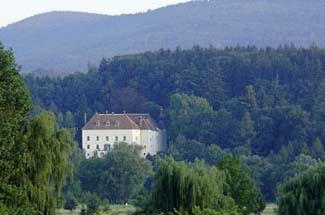 For over 300 years, the counts of Auersperg have lived in this romantic castle nestled in the woods of Lower Austria. Under the careful eye of Countess Hilda Auersperg and her daughter, Georgina Newall, the family home has become some of the most charming lodgings in the region. They don’t like to refer to their castle as a hotel, but rather as a private home with paying guests. Staying at this large manorial mansion today gives those guests a glimpse into the traditional lifestyle of an Austrian country lord. Guestrooms may be found on three floors set around a beautiful arcaded courtyard. Each is spacious and individually furnished with family antiques and portraits. You might find a four-poster or a charming, country-style bed (the vast Bauernstube room features a traditional wood-burning ceramic stove), and vaulted and wood-paneled ceilings in a few of the rooms take advantage of the castle’s unqiue architecture. Just below the castle and next to the golf course are three cottages with fully equipped kitchens that are ideal for families on a longer holiday. Two elegant salons and garden terraces invite you to linger for a while simply absorbing the atmosphere. By all means, take time to walk down to the stream that runs by the property and through some of the tiny nearby villages.